Dialogue is important for a number of reasons. It gives information, displays character, and oh yes, it lets your characters talk to each other! The easiest way to solve this problem is to read your dialogue out loud. This should show you where the worst problems lie. Then think of a more natural way of saying it. Writers of historical romance have an added problem when it comes to dialogue. They must make the dialogue sound as though it belongs in the Regency period (or the period in which the book is set) but at the same time, it must be accessible to a modern reader. a) One of the easiest and most usual ways of doing this is simply to avoid modern words. If you think your dialogue sounds too modern, then make a note of any words you think might belong to the 20th or 21st centuries. Then look them up in the Oxford English Dictionary (full size, not condensed). The OED gives the date of the words' first written use, next to the definition. b) You can add certain period words to give a feeling of authenticity. Some of this will happen naturally, eg words like carriage, pelisse, fan, will crop up anyway. You might want to use some cant terms, in the way that Georgette Heyer does, but a word of caution: don't overdo it. I usually let my minor characters use Regency cant, but not my main characters. This is because many readers (and editors) don't want a book if it contains too much cant, because they find it difficult to understand. c) Get rid of contractions. IN previous eras, people tended to say 'He did not' instead of 'He didn't'. a) This might be because the characters are not saying anything important. Make sure that, when your characters talk to each other, their conversations move the plot (either the emotional plot or the action plot) forward, or make sure the conversation reveals something important about the characters. b) It might be because your speeches are too even. If the speeches are the same length, then break the pattern. Make some speeches only one or two words long, and make others two or three lines long, and make some four or five lines long. This will provide variety. Perhaps have one person interrupt another now and again, and add an aside. c) It might be because your characters are agreeing over everything. Give them different points of view. 4) The dialogue doesn't suit the character. Look through some of your favourite Regencies. Notice the way dowagers speak, for example, and contrast it with the way the heroine speaks. By giving your characters different patterns of speech you will add variety to the book. 5) The dialogue all sounds the same. Contrasting dowagers and heroines is all very well, but you also need to differentiate the speech of characters who are much nearer in age and temperament. You can use real life to help you learn how to give your characters unique voices. If you are on any elists, print out a day's posts (preferably ones you haven't read), but delete the names of the posters before you print them. Then try and work out who said what. As you add the names to the posts, ask yourself, How do I know this post was written by John? How do I know this one was written by Mary? You will see that they each have a distinct 'sound'. Some posters will always use humour in their posts. Some will take everything literally. Some will write in an abbreviated style, eg. "In a hurry. Quick post. Just to say 'Well done.'" Try and identify all the different giveaways, and then you can use these in your characters. Another good way is to tape a conversation with friends. Notice how each one of them uses language in a different way. Some are sarcastic. Some are always concerned about others. Some are always concerned about themselves. The Bennet sisters in Pride and Prejudice are a good example. With five sisters, it would be very easy for them all to sound the same. But Jane Austen makes them all unique. Almost everything Lizzy says is teasing. Jane is always talking about people's good points. Kitty is sorry for herself much of the time, saying things aren't fair. Mary injects a moral into every conversation. Lydia talks about herself, men and clothes. Mrs Bennet's conversation reflects her obsession with her daughters, men and marriage. Mr Bennet teases and taunts. "I am very sensible, madam, of the hardship to my fair cousins, and could say much on the subject, but that I am cautious of appearing forward and precipitate. But I can assure the young ladies that I come prepared to admire them. At present I will not say more, but perhaps when we are better acquainted -- -- "
We can see straight away that he is pompous, self important and crawling. We can also tell that he is verbose, cares about what others think of him and has few social graces. The dialogue is one of the things that makes Pride and Prejudice a classic. It's worth reading the first few chapters, noticing the dialogue in particular, and seeing how each character has their own unique way of speaking. It's then worth thinking about your characters, and deciding how their characteristics, preoccupations, likes and dislikes will come across in their speech. 6) The dialogue is inconsistent. If you have a dishonest person, then when he speaks, his eyes will probably not meet the eyes of the other characters. Or, perhaps, if he is very sneaky, his eyes will meet their gaze 'with an appearance of candour.' Let the reader 'hear' him saying something she knows isn't true, to emphasise his character. A shy person will not, in general, tell others what to do, so don't have them going around and organising everyone. Have them make a suggestion hesitantly if they make one, for example. A confident person will go ahead and do things, so don't let them ask for permission, for example. Make sure your dialogue suits each individual character, and it will bring the characters to life. You can use dialogue to give information, instead of using narrative. This makes the book more dynamic. a)Jane walked through the grounds. She was missing her home. It was six months now since she'd said goodbye to her aunt and taken up a post as a companion. The time had been lonely for her. She had had her brothers and sisters to talk to at home, and she had had Hadrian the hound to play with. There had always been something happening. But here, alone with Lady Carstairs all day, she had little to do, especially as Lady Carstairs slept most of the time. b) Jane walked through the grounds, her mood pensive. She had just reached the lake when Lord Linchford appeared. 'Is anything wrong?' he asked. 'Sometimes,' she said, going no further, because what interest could the master of the house have in a lowly companion? 'And at other times?' he pressed her. She smiled as she thought of them. 'I didn't know you received so many letters,' he said. She stoppped, realising she was talking too much. But he did not seem to mind. 'Good God! You don't mean to say you let your brother chase unsuspecting visitors up trees?' he asked in horror. He began to laugh, too. His own hound, Claudius, ran up to see what all the fuss was about. Jane bent down and fondled Claudius's ears. Lord Linchford watched her thoughtfully. 'You must miss him,' he said. 'I do,' she said, as Claudius rolled over and invited her to scratch his stomach. Lord Linchford looked out over his vast acres, then back to Jane's slight form. 'It must be lonely for you here,' he said. She blushed. She had not meant to admit it, but she had been engrossed in playing with Claudius and the remark had come out naturally. Her hands stilled. Claudius, now he was no longer the centre of attention, stood up. Jane did not stand. She did not want to meet Lord Linchford's gaze. She was nothing but a companion, and she should not be complaining abuot her lot in life. Not if she wanted to keep her position. 'How did you know that?' he asked in surprise. He looked at her with a new respect. Jane froze at the mention of the name. Miss Goddard, the perfect beauty Lord Linchford had danced with the previous evening. And with that he strode on towards the house. From the above two examples you can see that giving the reader information in narrative is not as interesting as giving it in dialogue. Dialogue allows for other things, too. As well as information, it gives an opportunity for humour, and a chance for a rapport to develop. It also gives you a scene with the hero and heroine, instead of a scene with just the heroine. This is always a good thing! Notice, too, how it allows you to include body language, thoughts and feelings. Don't have page after page of dialogue with no narrative at all. As in the example, put in a few of the characters' actions, thoughts and feelings to add variety. Don't add 'he said' or 'she said' after the end of every speech, but put in enough of these 'tags' for the reader to follow the conversation. The above scene could have included action as well. Jane could have found Claudius standing at the bottom of a tree barking, whilst a new gardener clung to the branches. In gentle romances, ie romances that don't revolve around smuggling or spying or the like, action is still needed, and this kind of small, humorous action can be just the thing to lift a scene. To sum up. Dialogue should reveal character, give information, provide conflict and rapport, inject humour (if appropriate for the book) and allow characters a deeper understanding of each other. If this is too much to think about all at once, then write your first draft with wooden dialogue. Go back through it afterwards, and work solely on the dialogue. That way, you won't be overfaced. 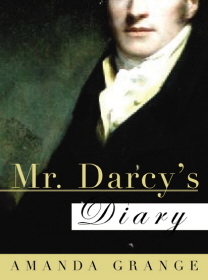 "Darcy�s Diary is an enjoyable journey into the mind of one of the most popular characters in literary history . . . a gift to a new generation of Darcy fans and a treat for existing fans as well." To read the entire review at www.Austenblog.com, click the link below (the review is of the hardback, which was called Darcy's Diary).